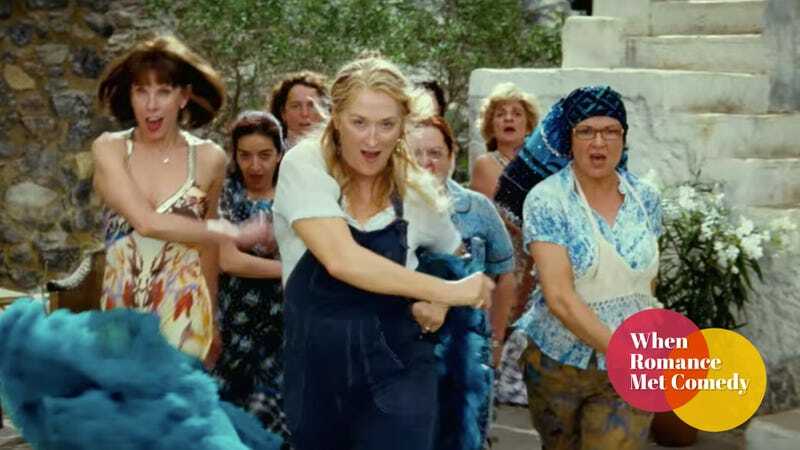 One of the best moments in the goofy, feel-good movie musical Mamma Mia! finds a trio of old friends donning the gaudy costumes of their girl-group youth. And it turns out that image reflects the creation of Mamma Mia! as well. It was a trio of women who created the 1999 stage musical and its 2008 big screen adaptation, both of which went on to achieve unprecedented financial success. Producer Judy Craymer, playwright Catherine Johnson, and director Phyllida Lloyd transformed a playlist of ABBA hits into a funny, self-aware, female-centric story about love in all its forms. And though Mamma Mia! is a deeply silly film, the way we react to its silliness actually says a lot about what we value in our pop culture. To be clear, Mamma Mia! isn’t a good movie musical, at least not in the traditional sense. It lacks the lush visuals of La La Land, the gorgeous choreography of West Side Story, the impressive production values of Chicago, the emotional complexity of Cabaret, and the perfect comedic timing of Singin’ In The Rain. Mamma Mia! isn’t the kind of movie you would shower with awards or hold up as a great cinematic achievement. But it isn’t aiming for that either. Mamma Mia! is the movie musical equivalent of a schlocky horror film or a B action movie or a stoner comedy. It’s ridiculous but it knows it’s ridiculous, which means that both its intentional jokes (everything scene-stealer Christine Baranski does) and its unintentional ones (Pierce Brosnan’s complete inability to carry a tune) become part of the film’s comedic value. In other words, Mamma Mia! is the Fast And Furious franchise of movie musicals. The brainchild of producer Judy Craymer, Mamma Mia! partially pioneered and wildly popularized the “jukebox musical” genre, in which pre-existing pop songs are retrofitted into a narrative storyline. (There are also jukebox musicals like Jersey Boys, which tell a biographical story about musicians and present their songs as in-world performances.) Set on the fictional Greek island of Kalokairi, Mamma Mia! uses the music of ’70s Swedish supergroup ABBA to tell the story of 20-year-old bride-to-be Sophie Sheridan (Amanda Seyfried) and her hardworking, free-spirited single mom, Donna (Meryl Streep). After snooping through an old diary to figure out which of her mom’s youthful flings might be her dad, Sophie impulsively invites to her wedding all three likely candidates: successful Irish-American architect Sam Carmichael (Pierce Brosnan), uptight British banker Harry Bright (Colin Firth), and adventurous Swedish travel writer Bill Anderson (Stellan Skarsgård). The movie unfolds during the hectic 48 hours that follow as Donna reconnects with her long lost loves, Sophie rushes to the altar, and the fatherly mystery begins to unravel. Jukebox musicals have a (not entirely unfair) reputation for being lowest common denominator entertainment. But in this case, writer Johnson actually doesn’t get enough credit for her deft work in bringing the project to life. Stringing together a cohesive plot around a set of pre-existing songs is the sort of thing that sounds easier than it actually is. (Imagine being handed a CD of Madonna’s greatest hits and just being told “go.”) And though Mamma Mia! is first and foremost concerned with being a rollicking good time, Johnson also manages to squeeze in some genuine emotional resonance alongside those ABBA hits. Mamma Mia! isn’t a rom-com in the traditional sense in that it doesn’t follow one central couple as they fall in love. (Although, if there’s one thing I’ve tried to drill home in this column, it’s that the rom-com genre doesn’t have just one storytelling template.) Instead, the musical anchors itself around the idea of love in all its forms. Donna owns a villa that’s said to be built on top of Aphrodite’s fountain, and Sophie’s wedding is the central event around which the story hinges. The musical juxtaposes the passionate, youthful love story of Sophie and her fiancé Sky (Dominic Cooper) with the more mature and melancholy one of Donna and her lost love Sam, ensuring there’s something for everyone in the romance department. And the musical ultimately delivers a lovely message about not rushing into youthful commitment but also not giving up on the possibility of finding true love at any age. But Mamma Mia! isn’t just concerned with romantic love. The show is actually first and foremost a mother/daughter story, although that’s presented as something of a thematic twist in the second half. Sophie is so obsessed with the idea of finding herself through finding her father that she doesn’t realize her mom has already given her everything she needs to succeed in the world. Streep’s big 11 o’clock number is a cliffside performance of “The Winner Takes It All” sung to Sam, but the movie’s emotional highpoint is a mother/daughter montage set to “Slipping Through My Fingers”—which works even better on screen than it does on stage. There’s also a strong female friendship theme running throughout the film, particularly between Donna and her lifelong gal pals/former backup singers Rosie (Julie Walters) and Tanya (Christine Baranski). As broad as her script can be, Johnson has a real knack for efficiently establishing relationship dynamics through realistic dialogue. And while a lot of the characters’ big-picture decisions are nonsensical (who would travel hundreds of miles to attend the wedding of the daughter of a person you haven’t spoken to in 20 years? ), on a scene-to-scene basis there are some wonderfully lived-in character interactions. Johnson also cleverly updates a few ABBA songs by changing their contexts rather than their lyrics. The creepy power dynamics of the 1979 song “Does Your Mother Know,” about an adult man flirting with an underage girl, becomes a more ironic number about a middle-aged woman fending off the advances of an overeager twentysomething. (Plus, Baranski just about steals the movie while delivering it.) Meanwhile, “Super Trouper” is reimagined as a sweet mother/daughter ballad. Mamma Mia! isn’t exactly a feminist polemic, but it does unfold almost exclusively from a female perspective. The male characters are all very much supporting players in a story that’s first and foremost about Donna, Sophie, Rosie, and Tanya. Mamma Mia! both celebrates female independence and argues that it’s perfectly fine for independent women to want romance too. After opening on London’s West End in 1999, the stage show quickly became a massive international success. Mamma Mia! ran on Broadway for 14 years and has had major productions in more than 50 countries. Given that the success of the stage show coincided with the movie musical renaissance of the early 2000s, it was a virtual certainty that the musical would eventually be adapted for the big screen. But Craymer held out for an offer that would allow her to maintain creative control of the project rather than just selling off the rights. Mamma Mia! followed the modern movie musical trend of casting famous actors rather than people who can actually dance and sing. But it broke the mold a bit by keeping the same writing and directing team for both mediums. (The Producers movie musical adaptation did the same, to much weaker ends.) Both Johnson and director Phyllida Lloyd made their feature film debuts on the project, ensuring that—for better or for worse—the Mamma Mia! movie maintained the same spirit as it made the leap from stage to screen. But unlike Producers director Susan Stroman, who was too attached to her original stage-bound version, Lloyd proved more than willing to adjust Mamma Mia!’s visual aesthetic and ground the film version in something a little more naturalistic. Though Mamma Mia! suffers from flat, washed-out lighting during a few sequences shot on sets in Pinewood Studios, the film balances things out with some gorgeous location shooting in Greece as well. Costume designer Ann Roth also does a lion’s share of the work in creating the film’s appealingly boho aesthetic (not to mention its over-the-top glam-rock costumes). Other than Tanya, whose glamorous nature is a running gag, the film’s female characters are dressed down in comfy clothes, naturalistic makeup, and windswept hair. And that casual aesthetic adds to the film’s wish-fulfillment nature; Kalokairi is a place where the coolest woman on the island wears overalls, dirty sneakers, and doesn’t seem to own a hairbrush. Talk about an anti-patriarchal dream. Lloyd tackles the age-old question of how to blend the heightened theatricality of a musical with the intimacy of film by just kind of going for it. One minute the movie is a low-key comedy unfolding against a beautiful Grecian backdrop. The next, Meryl Streep is writhing around on a roof belting the titular song as a literal Greek chorus backs her up. It works far better than it has any right to, thanks to both the film’s conviction and the endlessly catchy ABBA music that always keeps things moving. In tone, Mamma Mia! is part Gilmore Girls, part A Midsummer Night’s Dream, and part disco fever dream. There’s stiff competition when it comes to determining which actor is having the most fun in Mamma Mia! That Streep (who was 59 when she made the film) does a mid-air split halfway through “Dancing Queen” definitely puts her in contention; she shatters preconceptions about her stately Oscar-winner status with her earthy, expressive portrayal of Donna. Plus her voice isn’t half bad either. Seyfried’s palpable excitement at getting to play Streep’s daughter gives her a luminous glow throughout the film. (She also has the best singing voice of the bunch.) Walters and Baranski have the strongest grasp on the film’s tone, and the fact that it’s hard to tell whether Brosnan loves or hates the project only makes his performance more fascinating to watch. Yet it’s rom-com stalwart Colin Firth who ultimately seems the most giddy to be there, despite (or perhaps because of) the fact that he has one of the film’s smallest roles. And to their credit, everyone in the main cast is game to disco dance in full-on ABBA attire in the film’s exuberant credits sequence. Yet despite clearly connecting with a huge audience both on stage and on screen, Mamma Mia! is often written off as an embarrassing guilty pleasure, even by its ardent fans. And that seems wildly unfair. Mamma Mia! may not be a masterpiece, but it’s a movie that knows exactly what it wants to be. And what it wants to be is an upbeat, goofy musical about the emotional lives of imperfect women. Those aren’t qualities that tend to get celebrated in art (particularly not when they’re all combined together), but there’s no reason they shouldn’t be. It’s no more embarrassing to love a cheesy musical rom-com than it is to love a schlocky action thriller. Of course, musicals in general aren’t for everyone and Mamma Mia! is a very specific type of musical. But if there’s one thing to take away from Mamma Mia! it’s that it’s okay to be unabashedly silly and earnest—or to love unabashedly silly and earnest things. Next time: Maid In Manhattan and the rom-com career of Jennifer Lopez.